While this view has changed significantly, women writers are still understood, however grudgingly, as marginal to the literary culture of the time. Fewer women than men wrote, they wrote less, and their “choice” of genres seems somewhat impoverished; add to this the debate over translation as a potential vehicle of literary expression and we can see why early modern women’s writings are still undervalued. This book looks at how female translators represent themselves and their work, revealing a general pattern in which translation reflects the limitations women faced as writers while simultaneously giving them the opportunity to transcend these limitations. Indeed, translation gave women the chance to assume an authorial role, a role that by legal and cultural standards should have been denied to them, a role that gave them ownership of their words and the chance to achieve profit, fame, status and influence. 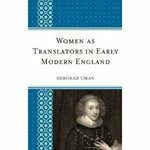 Uman, Deborah, "Women as Translators in Early Modern English" (2012). Fisher Bookshelf. 7.